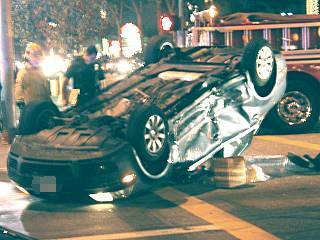 (Dec. 9, 2004) -- A horrific traffic collision at the intersection of Spring St. and Palo Verde Ave. in which one car flipped over miraculously did not produce visible serious injuries on Thursday December 9 at about 7:00 p.m.
LBPD Sgt. David Cannan says the air bags in both cars deployed...and the overturned car (a VW Passat, northbound on Palo Verde) was equipped with both front and side air bags. 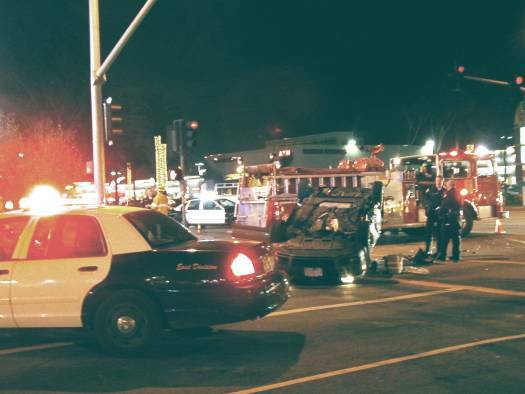 "It appears the newer air bags, plus seat belt use, prevented more serious injury," Sgt. Cannan told LBReport.com. The driver of the overturned car was transported to a hospital complaining of pain, "amazing, unbelievably fortunate when an overturned vehicle is involved," Sgt.Cannan said. The other car, a Mercedes (westbound on Spring), sustained front end damage.